Physicists of the Ludwig-Maximilians-Universität Munich shorten electron pulses down to 30 femtoseconds duration. This enables them to gain detailed insight into atomic motions in molecules. A team from Ludwig-Maximilians-Universität (LMU) and Max Planck Institute of Quantum Optics (MPQ) has now managed to shorten electron pulses down to 28 femtoseconds in duration. One femtosecond is a millionth of a billionth of a second. Such shutter speeds enable us to directly observe the truly fundamental motions of atoms and molecules in solids, similar to stroboscopy. Electrons are odd particles: they have both wave and particle properties. Electron microscopy has been taking advantage of this phenomenon for roughly a century now and grants us a direct insight into the fundamental components of matter: molecules and atoms. For a long time, still images were provided, but for some years now scientists are making tremendous progress in short-pulse technology. They create beams of electron pulses, which can, due to their extremely short flashing, provide us with very sharp images of moving atoms and electrons. Nevertheless, some of the fastest processes still remained blurred. Those who want to explore the microcosm and its dynamics need a high-speed camera for atoms. In order to sharply capture motions of such particles during a reaction, one needs to work with “shutter speeds” in the range of femtoseconds, since this is the speed of reactions in molecules and solids. Commonly, femtosecond-short shutter speeds are provided by short-pulse laser technology, but laser light is not able to spatially resolve atoms. Scientists from the Laboratory for Attosecond Physics at LMU and MPQ have now succeeded in producing ultrashort electron pulses with a duration of only 28 femtoseconds. This is six times shorter than ever before. The length of the matter wave is only about eight picometers; one picometer is a trillionth of a meter. 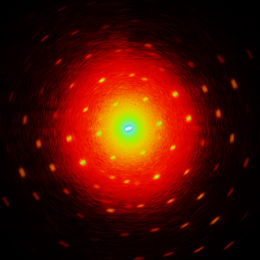 Due to this short wavelength, it is possible to visualize even single atoms in diffraction experiments. If such electrons meet a molecule or atom, they are diffracted into specific directions due to their short wavelength. This way they generate an interference pattern at the detector from which an atomic 3D-structure of the examined substance is reconstructed. If the pulses are short enough, a sharp snapshot of the movement is the result. To test the new technique, the physicists applied their ultrashort electron pulses to a biomolecule in a diffraction experiment. It is planned to use those electron beams for pump-probe experiments: an optical laser pulse is sent to the sample, initiating a response. Shortly afterwards the electron pulses produce a diffraction image of the structure at a sharp instant in time. A large amount of such snapshots at varying delay times between the initiating laser pulses and the electron pulses then results in a film showing the atomic motion within the substance. Thanks to the sub-atomic wavelength of the electrons, one therefore obtains a spatial image as well as the dynamics. Altogether this results in a four-dimensional impression of molecules and their atomic motions during a reaction. „With our ultrashort electron pulses, we are now able to gain a much more detailed insight into processes happening within solids and molecules than before“, Dr. Peter Baum says. „We are now able to record the fastest known atomic motions in four dimensions, namely in space and time“. Now the physicists aim to further reduce the duration of their electron pulses. The shorter the shutter speed becomes, the faster the motions which can be recorded. The aim of the scientists is to eventually observe even the much faster motions of electrons in light-driven processes.